There I stood in front of the glass case that April afternoon tired, edgy and hungry, looking longingly at the roast beef behind the glass – it was that time of the month. I held strong, my eyes imagining the prize. If only they had the right peppers, it would all come true. I was just moments away from receiving the best roast beef sandwich a girl with raging hormones could ask for when an older gentleman saddled up next to me at the Kroger deli counter wearing a straw hat and suspenders. My mind drifted away for a bit from my roast beef sandwich and my puffy, yet growling, stomach. This gentleman was not eyeing the rare roast beef inside the case like I was -- no, his eyes were fixed on a pair of golden wings. Him: tall, dark and handsome. Me: short, white and hormonal. But there was no denying it. I had to ask him. Maybe it was because I always wanted a father like Jim in Huckleberry Finn who might tell me stories about himself as a boy and a father or maybe it’s because I fell deeply in love with Sidney Poitier when I was nine, the first time I saw him in To Sir, With Love. So, maybe this was my chance, right here at Krogers, in front of all the Hillshire Farm cold cuts. Maybe he’d even tell me a story or two if I asked him to share half of my dream sandwich: rare roast beef stacked high atop mayo and cream cheese, slices of pepperoncini strewn everywhere, finished off with thinly shaved red onion on a crunchy French roll. But, alas, he was already smitten with a spring chicken. “How much you want for your wings today?” he asked the woman behind the counter. “99 cents a wing,” she replied, her face blank. “What in Darnation?! A dollar a wing?” his forehead rumpling from years of hard work. I couldn’t believe my ears either. My stacked roast beef sandwich was estimated to come in at around $3.99 when they finally finished assembling it with pepperoncini, but there was hardly any meat on those little wings he wanted. “Well, now, I try and eat healthy, I do.” taking off his hat, “But, now and again, I like them wings they roast and the gravy and such,“ standing with his hat over his heart, his blue work shirt buttoned all the way up to his chin. I wanted to scoop him up right there on the spot and have lunch with him forever and ever, roasting him chicken or beef on an open spit. There we’d sit, rocking back and forth on our big wide front porch, while my husband and children jumped up and down, trying to get our attention from inside the house. But, we… well, we were busy… we had cream cheese to carefully spread across long crunchy rolls. We had purple onions to shave down real thin, using that old tortoise shell knife of his, and pepperoncini to lovingly toss to our sandwiches. All the while, me listening to his stories about growing up along the Mississippi. “Ma’am!” the woman snapped from behind the counter. “Your sandwich is ready,” attempting to lift a brown package the size of a toddler. “Well, your fiancé, he sure is a lucky man, you bringing him his lunch at work,” he said before he shuffled away with two chicken wings and a little container of mash potatoes and gravy. “Oh, he’s one lucky man, all right,” the woman behind the counter muttered to her co-worker who had just spent 10 minutes looking for some damn thing called, “pepper-RON-cheeky” for a PMSing, middle-aged nutcake. As I headed to my car I couldn’t help but wonder where he was going to eat his lunch and with whom. Then I strapped my roast beef sandwich and myself into our seatbelts and drove away, holding myself up pretty good, bloated but renewed, and feeling like a spring chicken. I hope this letter finds you and your family full and peaceful after a relaxing Thanksgiving holiday, maybe still basking in the warm hum of a do-nothing weekend without homework assignments or college applications. I hope this letter finds you having weathered the Black Friday storm and the thundering aftermath of ads and commercials reminding you that there is still plenty of valuable “stuff” you cannot live without, all available at half-off for a limited time only. I hope this letter finds you comforted and decompressed from eating leftover turkey and stuffing and pie too many consecutive days in a row. Fingers crossed, your feet are up on the couch now and you’re reading your favorite book because you want to and not because you have to… and the only pressing thing you must find closure on is the movie you and your friends are going to order On Demand just as soon as you finish making the world’s greatest sandwich. And as you look inside your fridge and find the last leftover fixings needed to construct the greatest “leftovers” sandwich known to mankind, I hope you will find what every teenager should have - health and happiness - and, of course, a turkey-mashed-potato sandwich that includes a colorful swirl of fresh tomatoes and cranberry sauce topped with mayonnaise. Amazing how a leftover turkey sandwich on a Sunday afternoon can bring that kind of clarity. It really does hit the spot, though, especially right before Monday strikes again, and the world revs up its rhetoric machine all over again in a noisy cafeteria filled with ignorant jargon and stale Salisbury steak. Oak, finally, I hope this letter finds you illuminated by the light you shined on the world because you went to Mona Shores High School. You are a courageous leader in a time when there are few, but first, and more importantly, you are a still just a kid trying to enjoy his youth when and while he can. So go fix yourself another sandwich and enjoy every bite…. and for goodness sake, use real mayonnaise not that Miracle Whip nonsense. The Good News: It was this time a week ago, Sunday, that I stood waiting for “The World’s Greatest Latke!” in Little Rock, Arkansas. That’s what our Latkerista, Barry, announced, about to serve the first batch to a small group forming around a mini “latke-dome” at the annual Jewish Food Festival in Little Rock, Arkansas. Wait. Rewind. Let me enjoy rewriting that bounty of ground-breaking text all over again... the annual Jewish Food Festival in Little Rock, Arkansas. Surreal to me, as I write it again. The Bad News: The World’s Greatest Latke. Sorry, Barry. However! Barry, and all the people I met at the festival made up for the mediocre Jewish food I tasted there… and I’ll admit, I wasn’t able to give all the dishes the tasting attention they deserved. For this, I will blame my new Jewish Food Festival buddy, Zhao. Yes, it was all Zhao’s fault… had he not been such a “Chatty Kathy," (those who know me or Zhao might find reason to argue this description) I would have had more time to try the kugel and the blintzes and the corn beef and pastrami. But, then again, Zhao had nothing to do with the falafel snafu at the festival, so he claims… but now, all of a sudden, he decides to take The Falafel Fifth? All I know is, I never saw any falafels at the festival, as they were apparently en route from another location. Yet, Zhao’s backpack looked suspiciously puffy. So, who in the world is Zhao? Does he actually exist or did I simply dream him up? Some might say, yes, I invented him right out of thin air, because I wanted to experience a Jewish food festival in the South through an unlikely set of eyes and taste buds... a student from Beijing who now makes his home in Little Rock, Arkansas. It sounds a little like a scene from the final season of Lost. Imagine Jin asking Sayid to pass the sour cream at Sawyer’s house on Hanukkah, while Ben fries up another round of latkes for Locke and Charles Widmore. I first noticed Zhao in the crowd, not necessarily because he looked noticeably different, but because of the amount of items he was toting. He seemed ready for anything and everything, camera in hand, rain jacket tucked under his arm in case he got caught in a torrential Southern downpour, hauling a very large pack on his back ~ a soldier prepared for a long trek in unfamiliar terrain. The next thought I had was that his tour bus driver took the wrong exit off Interstate 430, landing him at the Jewish Food Festival instead of The Waffle House, the scheduled lunch stop on his tour of the South. “Have you tried anything yet at the festival?” I asked him. He nodded no, politely. “Would you like to have a latke with me then?” He couldn’t help but look startled and a little worried that a strange woman was asking him on a semi-lunch date at the Jewish Food Festival in Little Rock, Arkansas. “Have you ever had one before?” I continued. “Oh, I’ve got plenty. Let's go? They’re almost ready,“ as I whisked Zhao away and turned him into, The Latke Candidate. MorningSide Bagels will be featured at the Jewish Food Festival on May 16! Capps & Lox in Little Rock? Where does a self-proclaimed Metropolitan Foodie from San Francisco, an Italian girl who’s mostly mistaken for a Jewish girl, find a proper cappuccino in Arkansas? And what if she craves a warm, out-of-the-oven, bagel, smothered in cream cheese? Piled high with fresh lox, capers and a smidge of red onion, she wants to construct a bagel and cream cheese (almost) the same way her Jewish brother-in-law from Scarsdale, New York builds his... but where? She is standing in the “deep” South, as one of her San Francisco friends puts it, but she is suddenly optimistic and summoned by her conviction! She jumps off her porch in The Heights district of Little Rock, pocketbook in hand, and begins her quest for the perfect Jewish-Italian breakfast. I missed San Francisco more than usual that misty morning in Little Rock, remembering all the hours I had spent at Caffé Trieste and Puccini reading Cervantes and admiring Don Quixote, my hands laced around a brown ceramic cup, feeling like I was vacationing in Rome. I didn’t want to believe that the same feeling couldn’t be found somewhere in the South. So, why not Little Rock? I was determined to report back to my San Francisco friends that there was ethnicity and diversity in the little city that Bill Clinton made famous ~ the city I now temporarily call home. I was glib as I walked past Starbucks on popular Kavanaugh Boulevard. I tried not to stare shamelessly at all the sell-outs standing in line. But those people had settled! They had thrown in the towel on their cup o’Joe, choosing corporate America’s version of espresso in a cardboard cup over the little guy – that beloved café owner who likely knows the story of Luigi Bezzera and Desederio Pavoni who fathered Espresso in Milan at the turn of the century. Then suddenly I heard the voice of reality shouting, What are you doing? You are in Arkansas now! There are no immigrant Italians or Jews for thousands of miles! Turn around, order your Half-Caff, Grande, Carmel Macchiato and put a stop to this ridiculous charade! And that’s when I saw her…a little woman with a nose resembling mine. She was in a hurry, making a beeline for something or somebody, moving quickly past Starbucks and me. Her resemblance to my Jewish sister, Deb, was uncanny. She was just as petite and nimble, sporting a nose as elegant and crooked as Deb’s, but also Roman and long like mine. I wanted to run up and hug her… Had she somehow heard my cry for diversity? Had my tug for ethnicity helped to pull her down Kavanaugh in my direction? Had I just stepped into The Twilight Zone? She crossed the street, and I sprinted to catch up. My quest for the perfect Jewish-Italian breakfast was a virtuous one, so Mr. Self-Respect would just have to take a number and wait next to Mr. Pride and Mrs. Humility. She didn’t flinch. She didn’t cackle or shake her head. And she didn’t ask how long I had been stalk… uh.. following her. Instead, she grinned and I thought I saw her distinguished nose wriggle. Then she pointed to a red awning across a small parking lot. It read, Boulevard Bread Company. “There you are! I’m starving!” blurted out a woman with an accent, exiting her car. “I know, I know… I got here as fast as I could!” she tried to explain to her foreign friend. My tummy rumbled. My mouth trembled. I stepped in the red door behind them and my knees buckled, while the globe spun. I was suddenly standing in a San Francisco sound bite, amid a hubbub of baguettes and ciabattas baking in commercial size ovens. I was surrounded by hungry people chatting away, starting their day in front of a multitude of ethnic dishes and gourmet delicacies ~ and a surprising collection of well-priced imported and domestic cheese. There were Italian salamis to the left, lox, capers and olives to the right. All housed in a grand New York style deli case. As I took it all in, a wave of oak roasted espresso curled inside my Romanesque nose. My eyes darted east and found rows and rows of a very familiar brand of Italian coffee bean, Mr. Espresso, lining the shelves. My heart skipped. Mr. Espresso is based out of Oakland California, just across the San Francisco Bay Bridge. It was started by Salerno born, Carlo Di Ruocco. He began importing Italian espresso machines and beans to San Francisco area cafes and restaurants from his Bay Area home garage in the late Seventies. Carlo Di Ruocco is the quintessential “little guy” who started out just wanting to get a good cup of coffee when he first arrived in San Francisco from Italy. I couldn't have found a better espresso bean for a proper cappuccino! My gut instincts have never failed me ~ nor has my elongated nose. They both led me right to the doorstep of “the little gal“, Christina McGehee, the sole-owner of Boulevard Bread Company and Café. Her perceived motto for quality food and service shine through… give your customers the highest quality imported and local ingredients that you can, without gouging them in their pocketbook. While ordering my Mr. Espresso cappuccino, I spotted some of the best lox available on the wholesale and retail market, for a good price, cured from scratch by lox expert Browne Trading Company in Portland, Maine and shipped overnight to Boulevard Bread. Then my eyes welled up… below my stunned expression, sat two plump jewels facing me on the deli counter – a traditional Bialy bagel swith poppy seeds and caramelized onions and an Asiago Bialy. 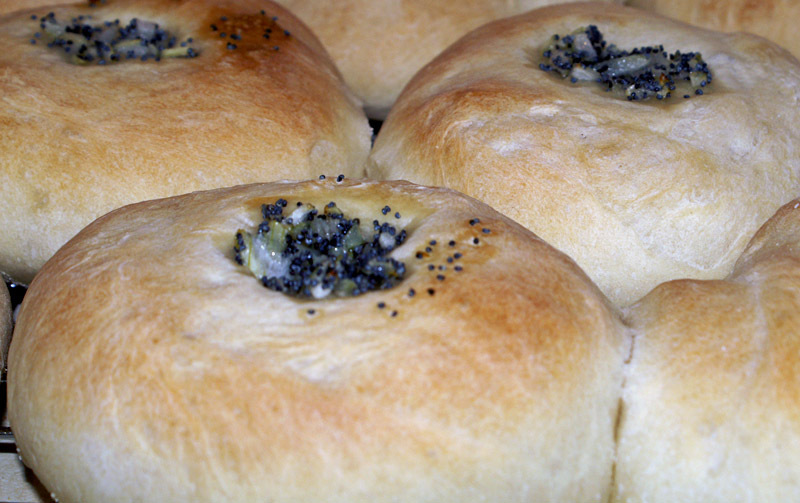 Here's a close-up of a family of Bialy bagels originally from Bialystoke, Poland. I was in The Twilight Zone… or possibly Manhattan? Chicago? Boston? I might have been in any metropolitan hotspot and yet I was standing in Little Rock, Arkansas. The typical cultural stereotypes of the South that my fellow-San Franciscans joke about had been debunked, even if only for one morning. I couldn’t help but feel triumphant. There are signs of cultural diversity in Little Rock, Arkansas ~ something I’ve come to admire and require from any progressive city.